I feel awful that I missed posting yesterday’s act of kindness. I got busy with my normal Sunday shenanigans and fell asleep before I realized I missed a post! Yesterday was a busy one with my normal Sunday Youth Church class and Mass. But afterwards, it was nice to slow down and catch up with one of my favorite couples. We headed to a restaurant that recently opened in our area, Chicago’s Chicken and Waffles. I couldn’t wait to have one of my favorite meals out in Atlanta so close to home! Unfortunately, the meal took A LOT longer than we thought. I think they were having a little trouble in the kitchen…and seeing as it was opening weekend, I gave them the benefit of the doubt that they were still getting things together. My sister, on the other hand, was ready to throw a sh*t fit. Haha! And she wasn’t the only one…there was another table that complained and eventually got up and walked out. After calming her down and changing the subject onto something she can enjoy ::ahem:: my love life, or lack thereof ::ahem::. It worked and we eventually got our meal and it was yummy! Patience, though, really was exercised on our part. It was an extremely long wait for us and at points we wondered if our waiter was even around anymore. After it all though, I was glad we showed some patience, and it was nice to hear an apology from our waiter even though we kept our mouths shut since we eventually found out that they were having some problems back in the kitchen. 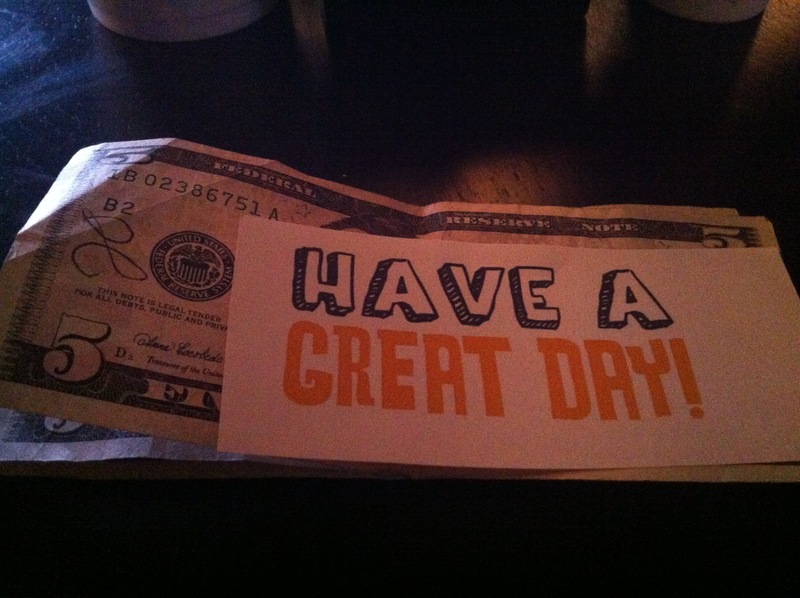 After it all, we left our tip and I added a nice kindness note for him. I’m sure after that long morning he needed something nice. And on to today’s act of kindness! But first another reference to yesterday! On our way into the restaurant, my sister spotted a penny heads up on the ground and picked it up singing “See a penny pick it up, all day long you’ll have good luck!” Little did she know that her little chant inspired today’s act of kindness! I wanted someone else to have the same reaction and good luck, so I dropped a couple pennies (heads up, of course!) for someone else to find everywhere I went today! This entry was posted in Daily Kindness and tagged acts of kindness, Chicago's Chicken & Waffles, Daily Kindness, Pennies for Luck. Bookmark the permalink.